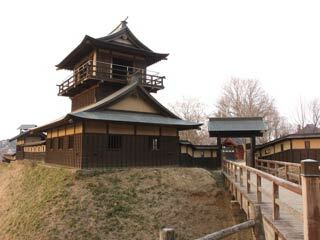 Iinuma Castle(飯沼城) is located in Sakai Castle Park at Bando city, Ibaraki. It was built in 1557 by Hojo Ujishige for protecting Hojo's land from Sakai, Yuki and Tagaya. It was discarded after the fall of Odawara Castle. Today, there is two stories keep, watches, moat, and garden. The current figure is very good reconstructed as the castle of Sengoku period. Also, well known for Sakura spots. Sakai Castle is also called Iinuma Castle because it was located in Iinuma. It was built in 1557 by Hojo Ujishige. The son of Fuma Kotaro, Magouemon stayed and protected with his 300 Ninja, but in 1590, after the fall of Odawara Castle, this castle was discarded.